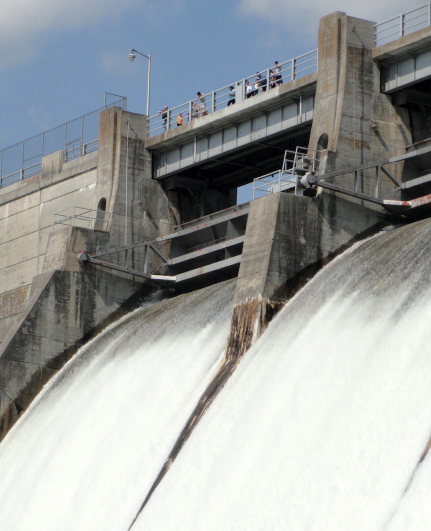 Hydro Q&A « Southeastern Federal Power Customers, Inc.
How many federal dams are there in the Southeast? There are now 22 major man-made lakes all across the Southeast built under federal programs and managed by the U.S. Army Corps of Engineers. These lakes help prevent flooding and harness the renewable power of water to generate electricity. Power produced at these lakes is marketed by the Elberton, GA–based Southeastern Power Administration (SEPA). Does power production at the lakes negatively impact recreation and other uses? In fact, it’s just the opposite. The sale of electricity from federal hydroelectric dams benefits all users of our beautiful, federally constructed lakes. That’s because proceeds from the sale of electricity pays back all the costs of building, operating and maintaining the hydroelectric facilities — and covers most of the costs of the reservoirs, which provide flood control, navigation and recreation. Do the taxpayers subsidize your purchase of federal hydropower? No, the original cost of building the dams and creating the lakes was considerable, and initially hydropower (electricity produced by lakes) was more expensive than power from other sources. Forward-looking consumer-owned electric utilities, however, believed hydropower would be an important future resource and contracted to buy the electricity produced by the lakes. Does power generation lead to lower lake levels? Water from lakes must pass through dams to generate electricity. Normally, this does not affect lake levels because, on the average, the same amount of water flowing into the lakes is released through the dam for downstream flow. Occasionally, however, during drought conditions, lakes drop below ideal levels. Sometimes when this happens, individuals and special interest groups try to exert pressure on the Army Corps of Engineers and government officials to restrict the flow of water through the dam. This is when everyone needs to remember that lakes and dams were built primarily to generate electricity and for flood control. Most of the time, enough electricity can be generated without affecting boating, fishing and swimming. But, during those rare times when lakes drop below ideal levels, it is important to remember why the lakes are there in the first place. Why not just get the power elsewhere and leave the dams for other purposes? When consumer-owned electric utilities are assured of access to hydropower, they can save millions by not building new generating plants. The demand for electricity from consumer-owned electric utilities varies significantly at different times of the day and year. We must have the generating capacity of the dams to meet all peak load requirements. Hydropower can help meet peak load requirements and provide the power reserve cushion that consumer owned electric utilities must have to operate. However, if hydropower is not always available, even when lake levels are low, it becomes an unreliable source of electricity and we must secure more expensive sources of electricity to meet peak demand. Now that you know that lakes were created for flood control and to generate electricity, we hope you will become a supporter of clean, renewable hydroelectric power. This is important because often it is only the special interest groups who are heard when lake levels are low. You can say “thanks to electricity” by speaking out to your neighbors, the media, and your local, state and national government representatives. With your help, we can protect our lakes and preserve the great natural resource of water.